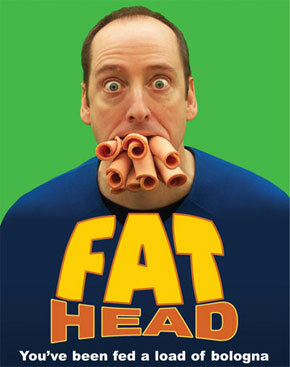 Suspicious Heuristics: "Fat Head": why fat is good and nutritionists are wrong. "Fat Head": why fat is good and nutritionists are wrong. I try to blog on topics within my field - economics - which is usually easy, because economics encompasses almost everything. However, I recently watched a health documentary which inspired me to brave the big, scary world of health and nutrition. 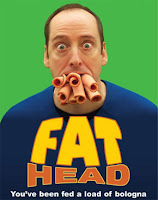 Written and directed by former health writer and comedian Tom Naughton, "Fat Head" is a must-watch for everyone, especially those who liked and/or took seriously Morgan Spurlock's "Supersize Me." Available on Netflix and Hulu as well for sale off the creators website, "Fat Head" is a quick, fun and informative video. However, for those who want the factual gist of it without the cheesy (but amusing) commentary and animations, I present this partially-digested version of the food documentary, broken into three main chunks for easy consumption. 1. The numbers in "Supersize Me" don't add up. In the movie, Spurlock's nutritionist repeatedly says he's consuming over 5,000 calories per day. Problem is, according to Spurlock's own rules, he only had three square meals per day. Even if he Super-Sized at every opportunity (which he claims not to have done) that still only adds up to a rough 3,600 calories. Where'd the rest come from? He must have added several desserts. If someone stuffs themselves with over twice the calories required for a healthy adult... is it really surprising that they gained weight? We could easily check the veracity of Spurlock's claims by looking at his food diary for the month -- but he won't release it. Naughton called his agents three times, other journalists have inquired, and I sent him a tweet to ask about it. No response. Pictured: my journalistic responsibility, fulfilled. So, Mr. Spurlock, if you truly ate 5,000 calories of McDonald's daily while sticking to your "diet," what are you so desperate to hide? The belief that this is all McDonald's fault rests on what Naughton refers to as "Lawyer Logic." That is, many factors may be causing obesity, but a lot of them - local restaurants, parents, school districts - don't have enough money to be worth suing. McDonald's does, so of course THEY'RE the ones to blame! "Fat Head" also points out the element of paternalism in these claims. As Eric Oliver (professor of political science at U. of Chicago) points out, anti-obesity conferences are attended mostly by skinny white people. It's perhaps no coincidence that anti-fat crusades have been directed at low-income groups and people of color, using many of the same epithets relating to "laziness" or "lack of self-control" which used to be part of the segregationist repertoire. By targeting obesity, skinny white people get the same sense of self-superiority that racism provided, without the politically incorrect connotations. In fact, they get to be on the news proclaimed as "food activists" or "health scientists" and are lauded for their efforts to control other peoples' lives. 2. Obesity is not actually that big of a public health problem, and for two reasons: the extent of obesity has been inflated, and so have the health risks of being overweight. It's common to hear that "1/4 of American adults are overweight" but the way government statistics calculate obesity, I'm surprised it's not more. A man who is 5'11" and 190 lbs. is considered overweight. According to the government, if you don't look like Napoleon Dynamite or a Kenyan marathon runner, you could stand to drop some pounds. Perhaps more importantly, even though more Americans are "overweight" we're still living longer than ever before. At one point, the CDC estimated that obesity was killing 400,000 people every year. To accomplish this statistical feat, the government researchers would count any cause of death in an overweight person as being caused by weight problems; get run over by a car while eating a cheeseburger, and CDC would say it was the burger's fault! Negative attention quickly caused them to reduce their estimate to a less staggering 25,000 per year -- an eighth of their former estimate. Give or take 375,000 and I guess they weren't too far off. As you may have already inferred, the obesity "epidemic" is a lot more more figurative than literal. A lot of America's heaviness can be explained by demographic trends just as well as eating habits. In the 1970s the average age was 27; now the average age is 36. As Naughton argues, is it really surprising that a population on average about ten years older would also be 8-10 pounds heavier? Weight gain could even be interpreted as a sign of our success; more people have time to enjoy leisure rather than doing exhausting work to make a living. If only more countries could suffer from this "problem"! 3. Low-fat diets are bad for your health, and aren't even any good for losing weight. The belief that high amounts of (saturated) fat causes high cholesterol, and that high cholesterol causes heart disease has been scientifically discredited. The connection between fatty diets and heart disease - the lipid hypothesis - was "discovered" by Ancel Keys in his famous seven country study. Why only seven? Data on 22 countries was available, but Keys just threw out the data that didn't fit his desired trend line, and went ahead to publishing. If you're an economist, that's a good way to get kicked out of grad school, but apparently it can get a health researcher's face on the cover of Time Magazine. The real relationship between heart disease and cholesterol is much more complicated. "Fat Head" does a very thorough and accessible coverage of the science behind those issues which I won't attempt to repeat here in full. I will say that the literature disproving the lipid hypothesis is stunning in its depth, significance, credibility of researchers, and apparent ability to be completely ignored when formulating government policy. Key's findings stuck around, in spite of mountains of conflicting medical studies, because it happened to agree with the beliefs of important government bureaucrats at the time. The official position became that a low fat, high carbohydrate (in the form of pasta, grains, and bread) was the way to stay healthy. People were advised to stay away from animal fats, which were a core food source during the course of human evolution. Only recently have processed vegetable oils and starches become widely available. By strange coincidence, this also happens to be when diabetes and heart disease start to become major killers. The government's advice: eat more processed oils and starches, not animal fats! "There's only one group of animals that lives well on grains, and that's birds." Director of the Wellness Research Foundation (interviewed on "Fat Head"). Processed carbs or starches are converted into sugar in the intestines. The glycemic index on "heart healthy" foods like Raisin Bran have around the same output in the body as table sugar. The body produces insulin to manage the high blood sugar levels. Over time, this causes diabetes and makes fat cells within the body retain more mass. This is why low-fat diets set people up to fail, and the McDonald's diet is actually not so bad. Eating large amounts of fat and protein but relatively little carbs, Tom Naughton dropped over twelve pounds in 28 days... And that's eating double Quarter Pounders! He demonstrates that if you make smart choices, it's possible to lose weight eating fast food for every meal. By corollary, the average person will probably not give themselves a heart attack or become morbidly obese by eating fast food a couple times per week. High blood sugar levels is a more serious public health issue than obesity. What makes high blood sugar especially insidious is that it does not always cause obesity and as a result, often remains untreated. Thin people can have high blood sugar but fail to take the situation seriously because supposedly heart disease and diabetes only happens to fat people. Rather than being overly concerned about what we eat, "Fat Head" argues we should be much more concerned about the (in)activity of Americans, both children and adults. It's not mentioned in the movie, but research shows that more time sitting down significantly reduces life-spans. That's right; I'm putting my life on the line to give you this blog! Instead of suffering through a restrictive diet, you're likely to be healthier from seeking moderate exercise and sensible eating habits. What I took away from "Fat Head" is the surprising degree to which nutrition and health has been politicized, and largely to the detriment of the American people. Health bureaucrats have been guided by what is popular and expedient, rather than following the advice of medical professionals and researchers. Everyone should watch Tom Naughton's "Fat Head"; even if you disagree with some of the conclusions, it is both contrarian and well-supported, making it a highly entertaining documentary as far as I'm concerned.